Cash-strapped South Korean banks and companies have to redeem or refinance a huge number of bonds that mature early next year amid the deepening economic slump and lingering credit crunch, industry sources said on Nov. 30..
Around 21.2 trillion won (US$14.5 billion) worth of bonds issued by local lenders are due during the first quarter of the year, and local companies have to redeem or refinance debts totaling 3.9 trillion won, according to the sources. "The problem is that local lenders and companies have to refund or redeem a huge chunk of debts maturing at a time when they face difficulty raising money," said Bae Min-geun, a researcher at LG Economic Research Institute. According to the sources, bonds issued in October by banks amounted to 4.2 trillion won, down 23 percent from a month earlier. Sales of corporate bonds also dropped 27.7 percent to 1.4 trillion won last month. South Korea has pumped money into the financial system as the deepening global credit crunch makes it harder for banks and companies to secure funds. 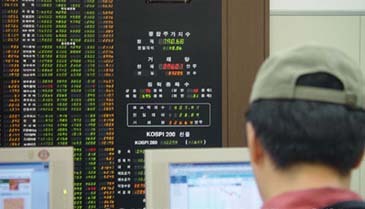 The Bank of Korea plans to offer liquidity of up to 50 percent of the 10 trillion-won fund to be set up for local corporate bonds and other debt securities, a move aimed at easing the credit squeeze facing local lenders and banks. With the bond fund, banks and other financial companies will buy the corporate bonds to extend a lifeline to cash-starved firms, including builders. The proposed bond fund came as domestic bond prices have continued to slide, even though the central bank has cut policy rates by a total of 1.25 percentage points in three steps since early October. The yield on three-year corporate bonds, which move inversely to prices, stood at 8.91 percent on Friday, compared to 6.73 percent at the end of last year.